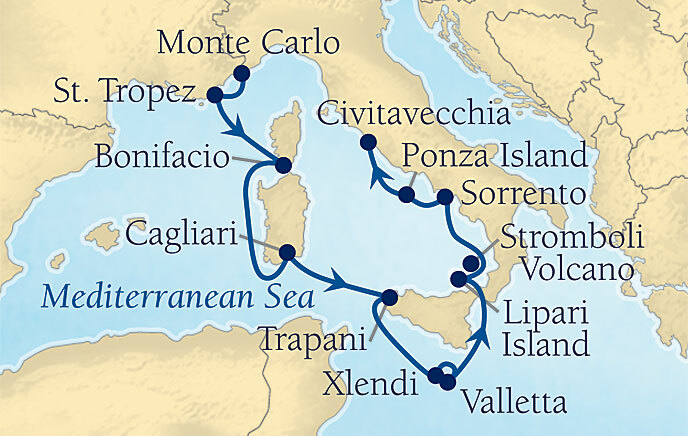 Cruises we've taken . . . and loved! We've been fortunate to have taken twenty-four cruises (so far) over the years with three more planned. Some have been better than others, but they've all been memorable. There's something about any cruise that you always remember. So . . . we've enjoyed something about each one. 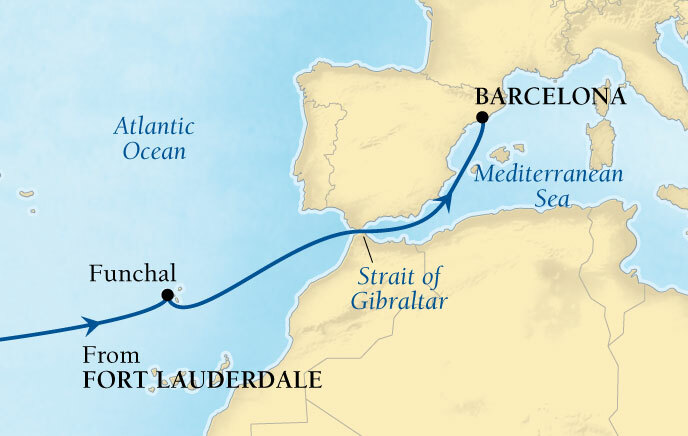 The sea has an attraction that is hard to describe, and all the cruises we've been on had the added advantage of stopping at some pretty exciting Caribbean island, Mediterranean, and Mexican Riviera locations – plus Atlantic crossings. And, if you can't tell already, we're definitely "beach people." You can get a glimpse of all of them below. 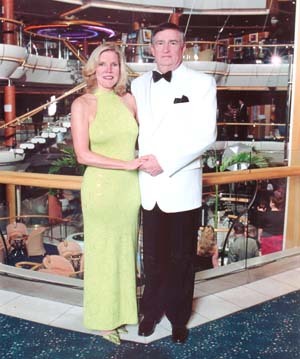 Our first cruise was on Norwegian Cruise Line's SS Norway – the former SS France, seven days out of Miami. The only true ocean liner of the lot, the ol' girl still has loads of class, but seems a bit out of place in the Caribbean circuit. We traded Marriott Rewards points and had a really nice outside cabin. Ports of call: St. Maarten/St. Bartholemew, St. Thomas, and Great Stirrip Cay, Bahamas. 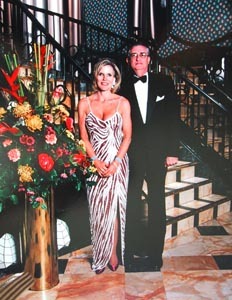 Best, we met two of our best friends, Michelle DeFronzo and Frank Salas on this cruise. We've traveled with and enjoyed them both ever since. Certainly the highlight of this cruise! We took two four-day, three-night cruises on Royal Caribbean's MS Nordic Empress, again from Miami. She was almost new on our first cruise with Frank and Michelle, but looked just as grand on our second with Nancy's company "Gold Team" cruise. 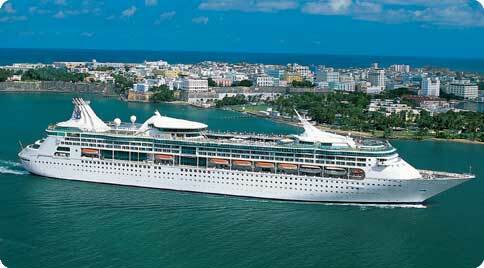 Ports of call: Nassau and Coco Cay, Bahamas. This is a great size ship and RCCL did a fine job. Being with friends on both cruises certainly made them special. Nancy's Gold Team next sponsored us on Carnival's Ecstasy, from Miami. Was this ever an experience! 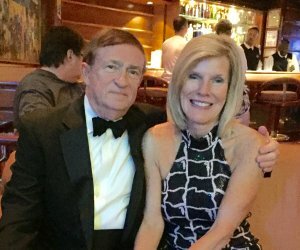 We enjoyed the weekend in Miami with Nancy's colleagues and the stops in Key West and Cozumel, but the ship was more like a Las Vegas casino than a cruise ship. We had a suite which helped a bit, but it was a crazy place. Maybe if we'd been ten years younger . . ? 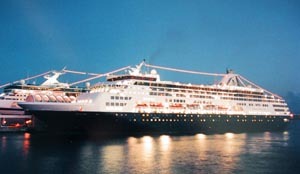 Our 1998 cruise – again, courtesy of Marriott Rewards – was on the Holland America Lines' ship MS Ryndam (one of those "dam" ships). Ten days out of Ft. Lauderdale. We traded points and paid to upgrade to a suite. A suite is a good thing on Holland America – you get the star treatment, and we enjoyed it. The stops in Nassau, St. Thomas, and Ste. Maarten/St. 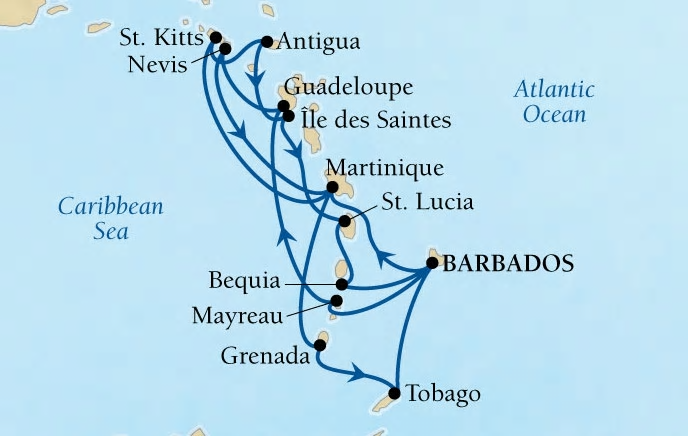 Martin were familiar, but always fun, and the new islands of St. Lucia and Barbados made the cruise "something new." We also stopped at their island, Half Moon Cay, Bahamas. HAL is a class act with both great food and service. The ship reflects a more up-scale clientele than some of our previous cruises. 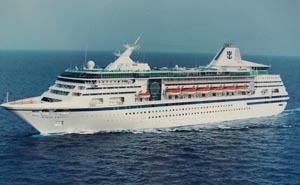 I think we'd do HAL again – maybe a Scandinavia Baltic cruise. 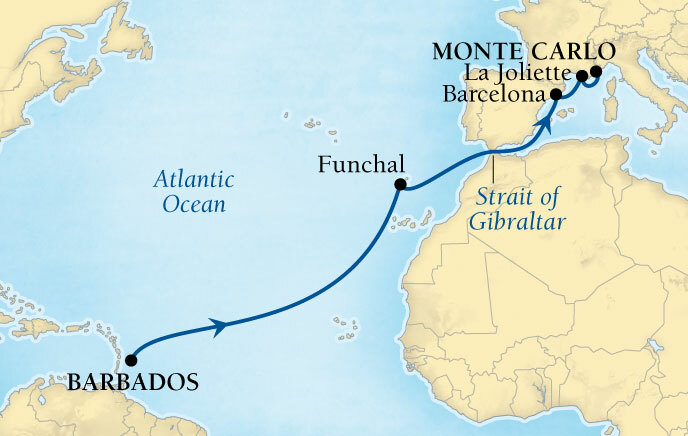 A WindStar cruise is different – or as they say, "180º from the Ordinary." They try hard to create that private yacht feeling – and they succeed! It's relaxing and you really get a chance to meet the other 140 or so passengers. None of the usual cruise ship stuff (note the lack of tuxedo and cocktail dress). We sailed (literally) from St. Thomas, US Virgin Islands with the first stop on it's sister island, St. John. Next stop was Sint Maarten (the Dutch side at Phillipsburg), although we spent the day on the French side, St. Martin. From there we sailed to St. Barthelemy (or St. Barths) for a bit more French culture. 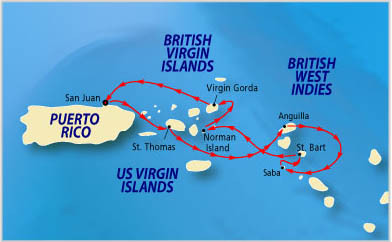 The remainder of the cruise was in the British Virgin Islands: Tortola, Jost Van Dyke, and Virgin Gorda. It was a wonderful way to preview the Virgin Islands. We hope to revisit each in conjunction with our timeshare at the Ritz-Carlton Club, St. Thomas who provided this wonderful experience. We sailed on the SeaDream II out of Charlotte Amalie, St Thomas, USVI following two glorious weeks at our Ritz-Carlton Club residence. 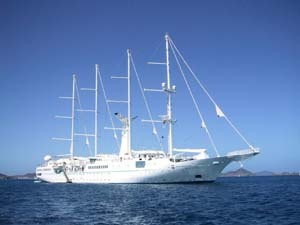 Ports of call included Saint Martin (the French side); Antiga; Nevis; St Barths; Jost Van Dyke, BVI; and Virgin Gorda, BVI. Four old friends and two new ones. 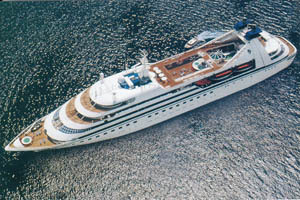 In 2003, SeaDream Yacht Club's two ships came in number two and number three in the worldwide Berlitz cruise ship ratings. We found out why. Eighty passengers and lots of personal service! 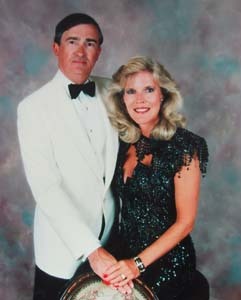 We sailed from Port Everglades in Fort Lauderdale along with 25 of Nancy's family to celebrate her dad's 80th birthday. Ports of call included Key West, Florida and Cozumel, Mexico -- the same destinations as our 1995 cruise on Carnival with Nancy's company. It was a fun time getting together with Nancy's extended family and her mom and dad certainly enjoyed it. We sailed on the SeaDream II out of San Juan, Puerto Rico following two glorious weeks at our Ritz-Carlton Club residence in St Thomas. Ports of call will include Marigot, Saint Martin (the French side); Gustavia, Saint Barthelemy; St. Johns, Antigua; Anguilla, BWI; Virgin Gorda, BVI; and Jost Van Dyke, BVI. It was great to be back aboard SeaDream! We'll do it again in 2008 – this time in the Med (Venice to Athens). 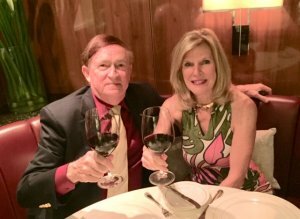 We were back on Holland America after a ten-year hiatus, this time on the Vista-class m/s Oosterdam. 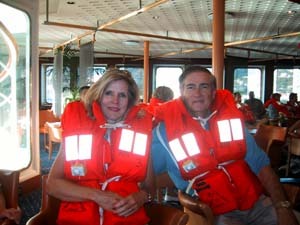 This was our first cruise on the West Coast along the Mexican Riviera. We boarded her in San Diego after a week at our Desert Springs timeshare in Palm Desert, California. 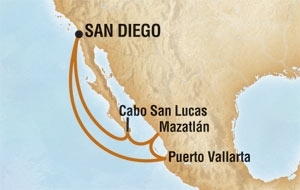 We spent three lovely days at sea along with these ports of call: Cabo San Lucas, Mazatlan, and Puerto Vallarta, Mexico. This was a bigger ship than we've been on lately, but we loved our previous voyage with Holland America, and we booked a suite again. It was a bit chilly for much beaching, but we enjoyed the top-notch service and attention to detail. We sailed on the SeaDream I out of Venice, Italy on 26 July 2008. 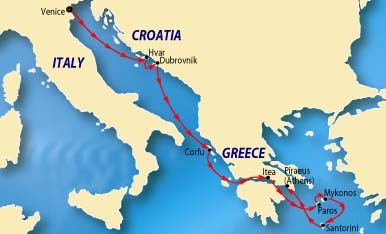 Ports of call included: Hvar and Dubrovnik in Croatia and Corfu, Itea, the Corinth Canal, and Santorini in Greece, disembarking Piraeus (Athens), Greece on 2 Aug 2008. 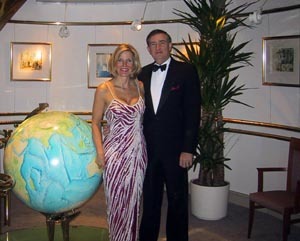 This was our third SeaDream Yacht Club cruise and our first to Italy and the Greek Islands. We're getting addicted to this style of cruising, or rather yachting. We returned to the Caribbean on the SeaDream II out of San Juan on November 21, 2010. 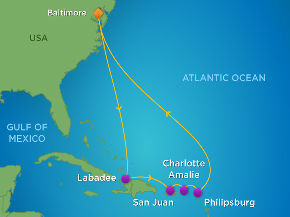 Ports of call will included: Charlotte Amalie, St Thomas, USVI; Road Town, Tortola, BVI; Norman Island, BVI; Marigot, St Martin, FWI; Gustavia, St Barths, FWI; and Virgin Gorda, BVI; disembarking in San Juan on 28 November 2010. 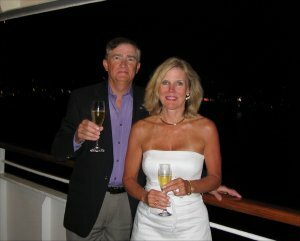 This was our fourth SeaDream Yacht Club cruise. We are definitely addicted to this style of cruising, or rather yachting. 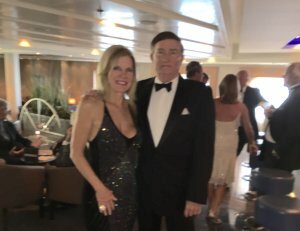 We were back on Seabourn (for the first time since 2002). 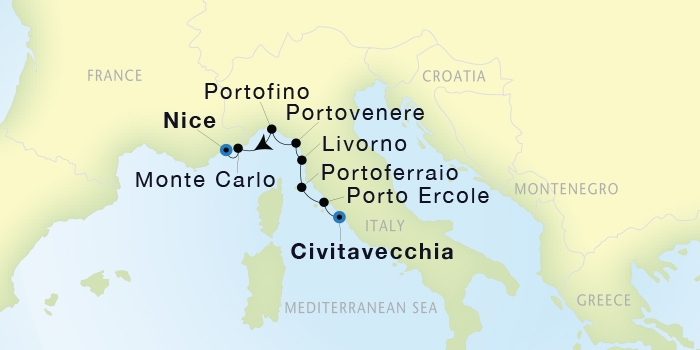 This time we did the Italian Riviera cruising from Monte Carlo, Monaco to St Tropez, France; Bonifacio, Corsica, France; Cagliari, Italy; Trapani, Italy; Xlendi Gozo, Malta; Vlletta, Malta; Lipari, Italy; Sorrento, Italy; Ponza, Italy; and returning to Civitavecchia (Rome), Italy. Seabourn was definitely a class act, and we're looking forward to another Med cruise with them. It was also a great reason for a couple of days in Monte Carlo and in Rome. We returned to the Caribbean on the SeaDream I out of San Juan, Puerto Rico in Jaunary 2013, following a stay at our Ritz-Carlton timeshare in St Thomas. 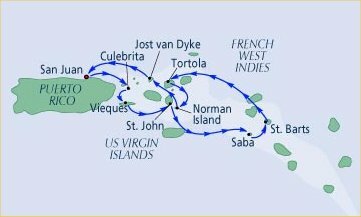 Ports of call included: Culebrita Island, Fajardo Bay, and Esperanza, Viequez in Puerto Rico; Cruz Bay, St John, USVI; Gustavia, St Barths, FWI; Soper's Hole, Tortola, Norman Island, and Jost van Dyke in the BVI. This was the second time that we missed Saba due to weather -- maybe someday. 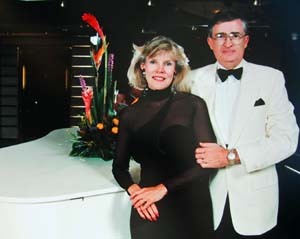 This was our fifth SeaDream Yacht Club cruise. We LOVE it! And we LOVE the 15% discount for on-board bookings too! We finally got to the Baltic on Oceana's new (and bigger -- too big for us) ship, Marina. We joined our Wexford Plantation neighbors who are members of the Wexford Event and Travel Club (ETC). 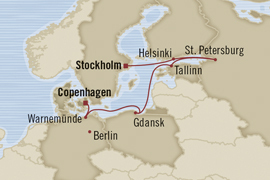 We embarked from Stockholm, Sweden with stops in Helsinki, Finland; St Petersburg, Russia (three days); Tallinn, Estonia; Gdansk, Poland; Berlin, Germany; and disembarked at Copenhagen, Denmark. This was a bigger ship that we're used to, but we enjoyed the company of neighbors and friends. For the first time, we followed the advice of many and tried a European river cruise. This one followed our participation in the meeting of the International Federation of Wine Brotherhoods (FICB) Congress in Reims, France. Stops along the Seine included: Paris, Vernon (Giverny), Les Andelys, Roven (Normandy beaches), Cavdebec-en-Caux, Mantes-la-Jolie, and returning to Paris. It was a great time with several of our FICB and Knights of the Vine friends. We'd heard great things about Uniworld and we agreed. 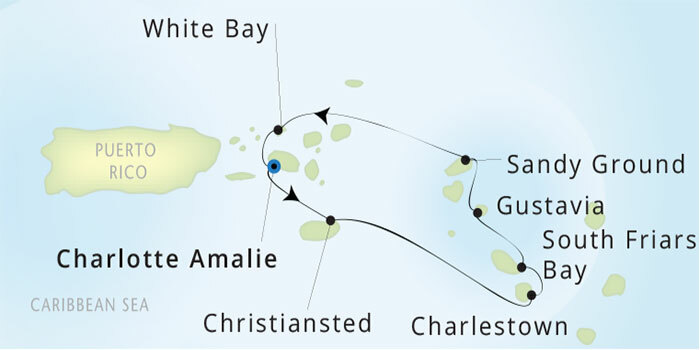 We are looking forward to this cruise on our old friend SeaDream II from St Thomas to St Thomas – with a few new stops: Charlotte Amalie, St Thomas, USVI; Cruz Bay, St John, USVI; Charleston, Nevis; South Friars Bay, St Kitts; Gustavia, St Barths, FWI; Sandy Ground, Anquilla; Jost van Dyke, BVI; returning to Charlotte Amalie, St Thomas, USVI. We'll spend a week at our Ritz-Carlton Club timeshare on St Thomas following the cruise. 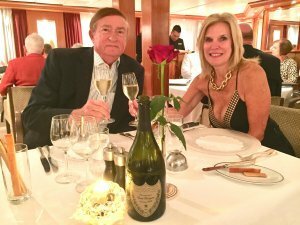 We were back on Seabourn – this time for our first-ever Atlantic crossing on the Seabourn Quest. Nancy has wanted to do this for a long time. 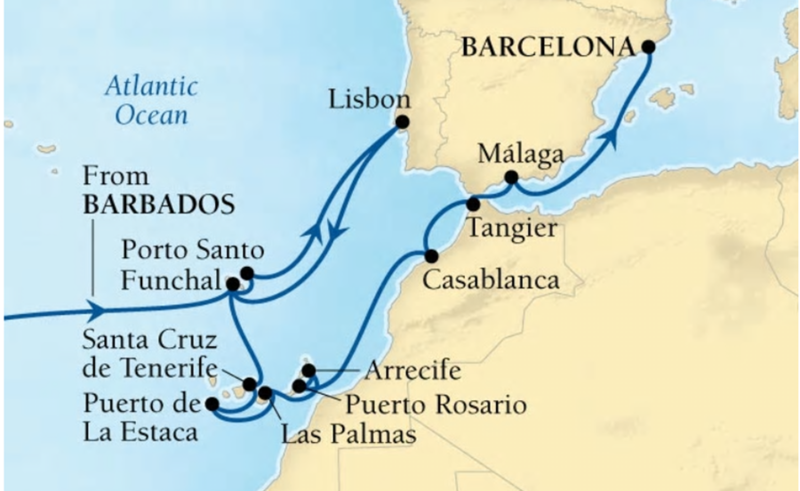 We embarked from Fort Lauderdale, Florida, spend nine days at Sea enjoying the great Seabourn amenities and service, then Funchal (Madeira), Portugal, followed by another three days at Sea, disembarking at Barcelona, Spain. We've always wanted to try a crossing and this was our chance. The "new, bigger" Seabourn Quest is about the right size for this adventure. Even the captain said that is was one of his smoothest crossings – we appreciated that! We sailed with Nancy's immediate family from Baltimore, Maryland for her Dad's 91st birthday. We embarked Baltimore, Maryland , and after two sea-days arrived in Labadee, Haiti -- our first time there. Next was San Juan, Puerto Rico. This is where the cruise pretty much fell apart. Nancy's dad had trouble swallowing and the ship's physician put him off the ship in San Juan and sent him to the hospital. He wasn't allowed to return to the ship, so we stayed with him, spent the night in San Juan, and flew back to Baltimore. Next was San Juan, PR and St Thomas, USVI. Afterwards teh rest of the family sailed to Phillipsburg, St Maarten, DWI, followed by three additional sea-days before returning to Baltimore. Not one of our greater experiences. Good news is that Nancy's dad is doing well now that he is home. We cruised our old friend again, SeaDream II from St Thomas to San Juan – with a few new stops: Charlotte Amalie, St Thomas, USVI; Cruz Bay, St John, USVI; Saba, NA; Gustavia, St Barths, FWI; Marigot, St Martin, FWI; Soper's Hole, BVI; Great Harbour, Peter Island, BVI; North Sound, Virgin Gorda, BVI; disembarking at San Juan, PR. 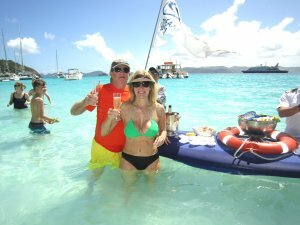 Once again, we spent a week at our Ritz-Carlton Club timeshare on St Thomas following the cruise. 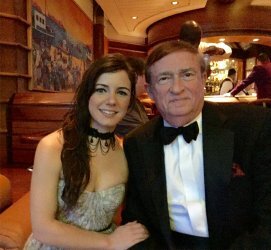 We were back on Seabourn – this time for our second Atlantic crossing on the Seabourn Odyssey. Nancy loved the first crossing and we both wanted to do it again. Thi one was equally enjoyable. We embarked this time from Bridgetown in Barbados, spent seven days at Sea enjoying the great Seabourn amenities and service, then Funchal (Madeira), Portugal, followed by another three days at Sea to Barcelona, Spain, followed by Marseille, France and disembarked in Monte Carlo, Monaco (our favorite destination in all the world). 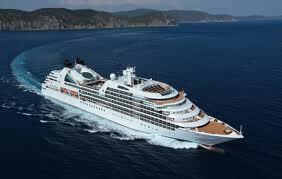 The "new, bigger" Seabourn Odyssey is about the right size for this adventure. We of course spent a few days in Monte Carlo on our arrival. 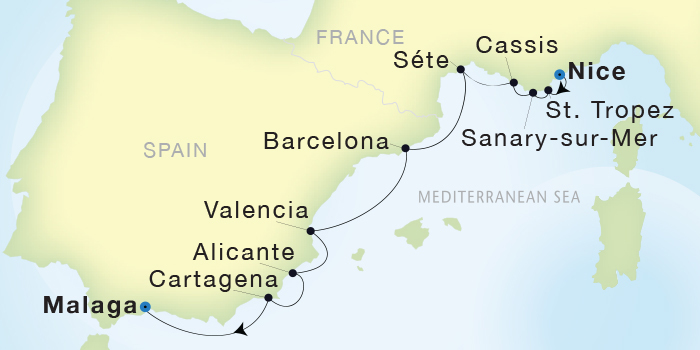 We were back on our old friend again, SeaDream I from Nice, France to Malaga, Spain stopping in St Tropez, France; Sanary Sur-Mer, France; Cassis, France; Montpellier, France; Barcelona, spain; Valencia, Spain; Alicante, Spain, Cartagena, Spain; and disembarking in Malaga, Spain. 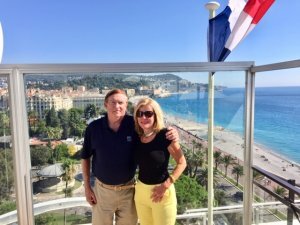 We spent a few days at our Marriott Vacation Club timeshare in Marbella, Spain following the cruise and three days with cruise buddies in Sandbanks, Poole,England. Another great trip on Seabourn Odyssey. 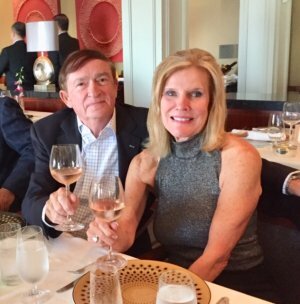 This one was to celebrate Nancy's birthday, and we plan to do it in grand Seabourn style. 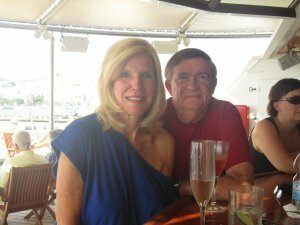 This was our first Seabourn cruise in the Caribbean, and we get to visit some new islands. We embarked from Bridgetown,Barbados to Trois Ilets,Martinique; Carambola Beach, St Kitts;St Johns, Antigua; Terre-de-Haut, Ilesdes Saintes; Castries, St Lucia; Port Elizabeth,Bequia, St Vincent; Bridgetown,Barbados; Saline Bay, St Vincent; Basse-Terre, Guadaloupe; Charlestown,Nevis; Fort-de-France, Martinique; Saint Gorges,Grenada; Charlotteville, Trinidad; disembarking back at Bridgetown, Barbados. Seabourn called it, "14-Day Caribbean Gems in Depth" -- a pretty good description. Some old friends and some new ones. 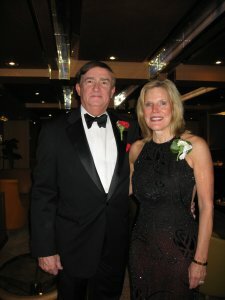 We took our first cruise aboard Cunard -- on their flagship ocean liner, Queen Mary 2. 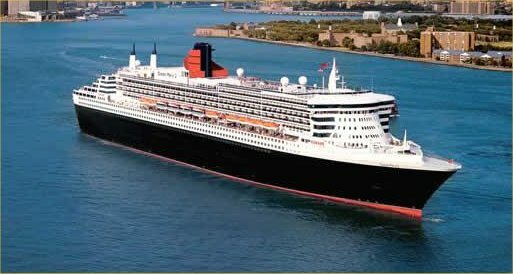 She is certainly bigger that we are used to, but a North Atlantic crossing on a true ocean liner was on the "bucket list." Certainly our booking in a Princess Grill suite provided a bit more intimacy. 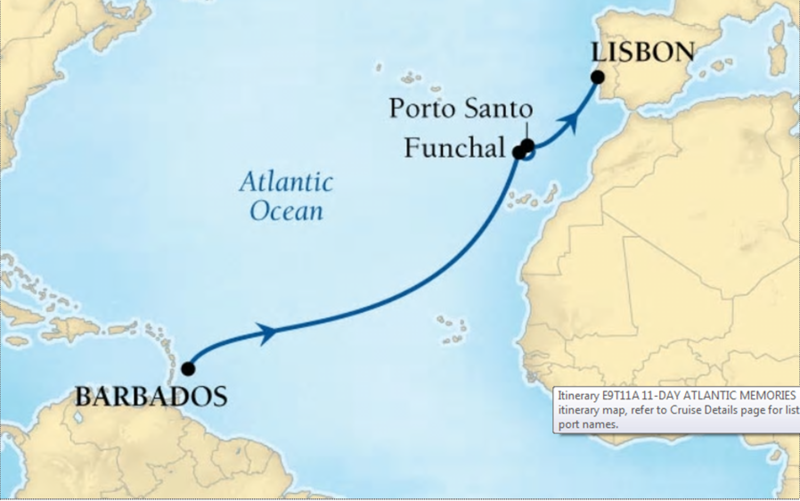 This was our third Atlantic crossing and we experienced as smooth a seas as we enjoyed on the other two. 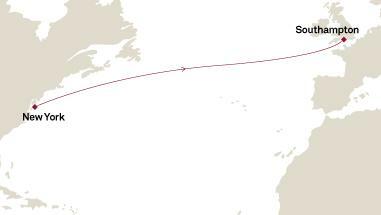 It will be a short seven days from New York City to Southampton, England. Naturally, we enjoyed some time in both New York City and London on each end. We were back on SeaDream I from Rome, Italy to Barcelona, Spain stopping in Porto Ercole, Italy; Portoferraio, Elba, Italy; Liverno (Florence), Italy; Portovenere (Cinque Terre), Italy; Portofino, Italy; Monte Carlo, Monaco; Nice, France; Saint-Tropez, France; Sanary-sur-Mer, France; Roses, Costa Brava, Spain; Alcudia, Mallorca, Balearic Islands, Spain; Palma de Mallorca, Balearic Islands, Spain; Ibiza, Balearic Islands, Spain; and disembarking in Barcelona, Spain. 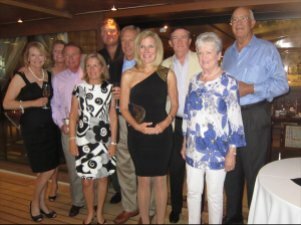 This was another of SeaDream Yacht Club's wine cruises. We enjoyed the one in October 2017, and we just had to do it again -- this time in Italy. We will depart again from from Bridgetown, Barbados on another Atlantic crossing aboard Seabourn Odyssey; At Sea (7 days); Funchal, Madeira; Porto Santo, Porto Santo Island, Portugal; At Sea; Lisbon, Portugal; At Sea; Funchal, Madeira; Santa Cruz (Tenerife), Canary Islands, Spain; Puerto de la Estaca, El Hierro, Canarias, Spain; Las Palmas, Gran Canaria, Canary Islands, Spain; Arrecife, Lanzarote, Canary Islands, Spain; Puerto del Rosario, Fuerteventura, Spain; At Sea; Casablanca, Morocco; Tangier, Morocco; Malaga, Spain; Barcelona, Spain. We will reprise our wonderful 2014 Uniworld Paris and Normandy river cruise -- this time aboard their new ship, the S.S. Joiem de Vivre.. 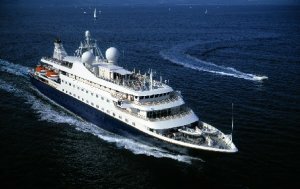 The cruise is a Signature Cruise sponsored by the Military Officers' Association of America (MOAA). 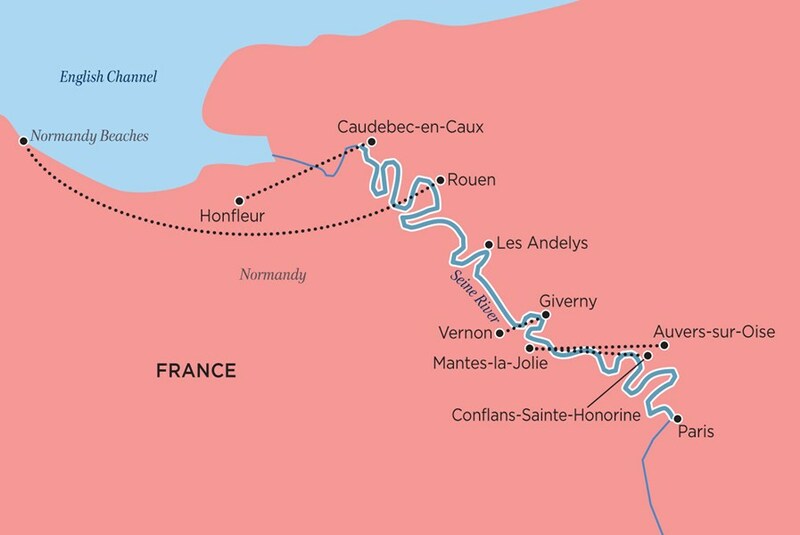 Stops along the Seine include: Paris, Vernon (Giverny), Les Andelys, Roven (Normandy beaches), Cavdebec-en-Caux, Mantes-la-Jolie, and returning to Paris. We were so spoiled on Uniworld in 2014, we are looking forward to a repeat performance. 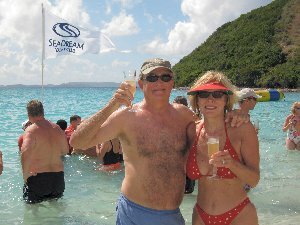 We'll be back aboard SeaDream Yacht Club for another Caribbean cruise following two weeks at our Ritz-Carlton Club timeshare in St Thomas. 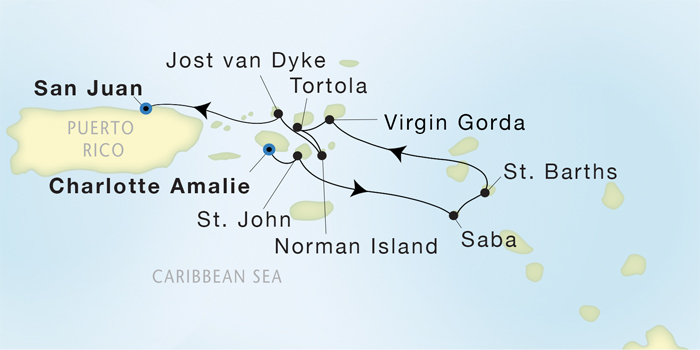 We will depart from Charlotte Amalie, St Thomas, USVI and travel to Cruz Bay, St John, USVI; Saba, NA; Gustavia, St Barths, FWI (overnight); North Sound, Virgin Gorda, BVI; Soper's Hole, Tortola, BVI; Norman Island, BVI; White Bay, Jost van Dyke, BVI; and disembarking in San Juan, PR. We are planning our first cruise with the new Ritz-Carlton Yacht Collection. It looks to be just our style -- and as Ritz-Carlton owners, we have high expectations. 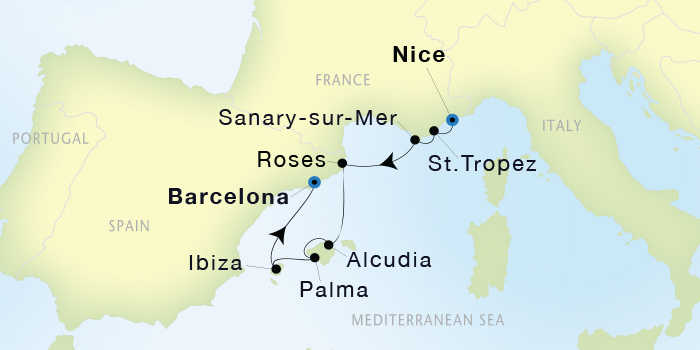 We will depart from Barcelona for a leisurely cruise through the nearby Balearic Islands with stops in the jet set hotspot of Ibiza (a two-night stay), Formentera, Mahon, Sóller (overnight), and finally disembarking in Palma de Mallorca. We hope to add a stay at the Marriott Vacation Club resort Club Son Antem on Mallorca. 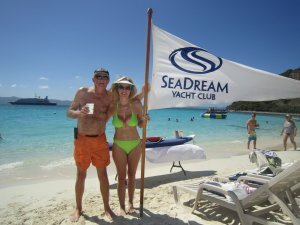 We'll be back aboard SeaDream Yacht Club for yet another Caribbean cruise, again following two weeks at our Ritz-Carlton Club timeshare in St Thomas. 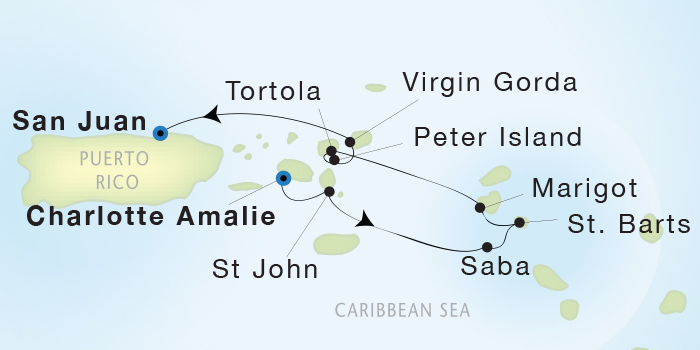 We will depart from Charlotte Amalie, St Thomas, USVI and travel to South Friar's Bay, St Kitts; Gustavia, St Barths, FWI (overnight); Sandy Ground, Anguilla, BWI; Spanish Town, Virgin Gorda, BVI; Norman Island, BVI; Beef Island, BVI (overnight); White Bay, Jost van Dyke, BVI; and disembarking in San Juan, PR.